Here time has pass’d-what ruin marks his way! Turned not his step, nor could his course delay! The reader of the eight preceding rambles has, probably felt surprise at my not having sooner conducted him to so celebrated a specimen of architectural antiquity as the Abbey of Corcomroe presents; and his astonishment will no doubt be increased, when I inform him that this remarkable ruin is within about three miles of New Quay, the centre of these, our irregular autumnal excursions. The truth is, that having some years ago, under my assumed signature B, given an account of that Abbey to the public, through the medium of an entertaining and patriotic periodical publication, (now, like most of the produce of the Irish press, discontinued,) I had but little relish to again travel over the same ground. It would, however, be justly reckoned unpardonable in a series of papers descriptive of the very interesting scenery surrounding New Quay to omit altogether the topography of a place rendered famous by the beauty its architecture yet displays, even whilst mouldering in ruin the princely donations and titles of its former benefactors - the sanctity of its inmates in days long past, and the existing monuments of royal dissolution which still enshrine the silent occupiers of its walls. I shall therefore endeavour in the following article so to vary my former publication as to prevent this appearing a mere transcript of the other, although the history and delineation of scenery common to both papers must necessarily be similar. 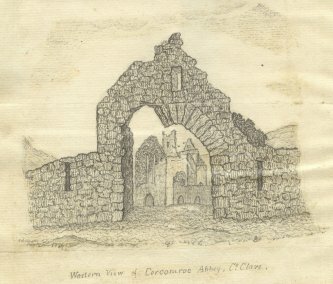 The Abbey of Corcomroe is situated south of New Quay, in a lonely winding vale surrounded by lofty mountains in the Barony of Burren and county Clare. It was formerly denominated the Abbey De Viridi Saxo, or of the green rock, in consequence of the amazing fertility of the mountainous and stony tract around it. The interior of the Abbey presents at this day a mere assemblage of rugged stones, and it seems as if, owing to the want of clay to cover the numerous corpses interred there, the neighbouring fragments of limestone were gathered within the walls for the purpose. The consequence is, that the whole interior appears to be a mixed collection of earthless rocks and blanched human bones. The ruin of Corcomroe Abbey is one of great splendour. When the visitor stands inside the building, and near to one of the angles formed by the western termination of the nave, immediately under the square steeple or belfry, he has before him the choir, exhibiting a vaulted roof, the frette work and groinings of which are inferior to none, perhaps those of Holycross, in the country of Tipperary excepted. The north and south transepts open to the right and left by large plain circular arches, through one of which is visible a small chapel on the south side of the choir. There was a similar and equally beautiful little chapel on the north side of the choir at the time I first visited the Abbey, but it has been since stopped up by some person regardless of architectural symmetry, and anxious only to enclose a mausoleum for a family resident in the neighbourhood. This alteration has barbarously disfigured the interior of the building. The Abbey-church stood in the centre of a square plot of land, containing about six acres, and which was once enclosed with a wall ten feet high. The entrance to the enclosed ground was through an arched gateway at some distance S.S.W. of the church. A gate-house stood on either side. The arched gateway was standing a few years ago, and through it, dilapidated though it then was, the venerable principal ruin appeared sublime indeed, resembling, when seen in the distance, some fairy scenic representation of ancient buildings occasionally exhibited beneath the impending nearer proscenium of a theatre (this arch over the gateway leading into the Abbey enclosure was shaken by the violent storm of the 6th of January 1839 and it fell in a few days after. It is however perpetuated in the amored faithful pencil sketch). The portion of the Abbey standing westward of the steeple, appears to be more ancient than the part to the eastward of it. The former, excepting the western doorway, and two narrow windows over it, is of far more rude workmanship than the reminder. It has lateral arches, which seem to have once opened into side aisles that have long since vanished. These arches are of the most rough description. This end of the fabric appears as if the steeple had been erected against, not upon it. The heads of the lofty and narrow western windows are the Saxon semicircle, while those of the choir are in the pointed style. How highly stored must have been the mind of that once highly gifted personage, who could, merely from memory, while burthened with the onerous duty of a Judge of Assize, and amidst the confusion and interruption ever attendant upon circuit, commit to paper with the ready hand, which imagination now conjures up as writing before me such a compendium of architectural learning such a complete, yet succinct and beautiful essay on the ancient buildings of Ireland! Let me now conduct the reader back Corcumroe.— The steeple—which separates the more ancient portion of the Church from that of comparatively modern date—is in form a narrow parallelogram, and built on corbels projecting from the eastern and western sides of the gable-end wall. The entrance to the steeple is at an elevation of about sixteen feet above the level of the floor, and opens into a narrow and straight staircase leading to the embattled summit of the tower, where it is terminated by the parapet. At a few feet beneath the top are four windows —viz., one in each wall. These look to the four cardinal points of the compass. There is a very excellent echo about a hundred yards in the rear or north side of the Abbey: it distinctly repeats words of two syllables. The cloisters, refectory and dormitory, all stood on the south side of the Church. There were two small apartments built linny-wise against the northern wall on the outside --probably one of them was the Abbot’s private chamber, and the other an anti-room leading to it. Interred within the precincts of this Abbey are many members of a family known in the Irish language, by the name Markahawn, Anglice, Rider, or Ryder, whose skulls have the reputation of being of an amazing thickness. The writer of these rambles has seen one of the skulls here, which was about half an inch thick. The neighbouring peasantry say it is not uncommon to meet some of the Markahawn skulls nearly an inch from inside to outside. The living members of this remarkable family are decent farmers, resident near Turlagh, not far from the Abbey. Some persons informed me that they were rather quarrelsome people— but the skull, which came under my observation, did not exhibit the organs, said to indicate that propensity. In the third number of these rambles, some account is given of the village of Turlagh, just mentioned. In addition to what is there said, it may be here further remarked, that Turlagh was formerly known by the name Turbagh, and it was accordingly granted by these names the 23rd of May, in the 19th year of King Charles the II, to Sir Wm. King, Kt. It appears from the patent roll of that year, that Sir William previously had an annuity of one hundred and fifty pounds granted to him out of the quit-rent on this and other lands, from the 6th of March, 1673, when his regiment was reduced. The annuity was granted as a reward for his conduct in the war against the Hollanders. The place is spelled Turloghie in some old maps. The most ancient tomb in the burial-place of Corcomroe, is that of Connor O’Brien, King of Thomond, who was killed in battle in the year 1267. An engraving of it from a drawing by me was published in the Dublin Penny Journal. Is anncoir gorm fa choraibh do chábla óir. Is anncoir gorm fa coraibh do cabla oir. The family motto is “Spes mea et fides tenere anchorane roboris.” This ancient family, of which the late worthy Master of the Rolls was member, is descended from the race of Irby Feargus Riogh, and Maude Queen of Connaught. His honour, in consequence, used the full-faced helmet on his armorial bearings. The bards of former times have occasionally poured forth their verses in praise of this family. Thus the death of Donough O`Loughlin of Burren, which took place in 1714, was the subject of two poems. One was written by Thomas O`Conduibh, a native of the county Clare. It consisted of sixteen verses, beginning “Orcra dear, Doncad caoim O`Loclain a cere sinte.” “Sorrow, tears, gentle Donough O`Loughlin in the clay is stretched.” The second poem was an elegy written by the celebrated Hugh M`Curtin, the poet, historian, grammarian and lexiographer, who was also a native of the county Clare. It contained seventy two verses, beginning with the philosophic reflection, “Eagh dhonchada is dol daoine.” “The death of Donough is the way of men.” The last mentioned also wrote a poem on the ship of O`Loughlin of Burren in 20 verses, beginning, “Beanaig an bare blathun`te bealchumtha.” “Bless the nice formed well fastened bark.” Had the bardic spirit inspired our countrymen of later years, what a noble and exhaustless theme for song the virtues of the late Sir Michael O`Loughlin would supply to the poet of our own days. Let us again revert to the history of this Abbey. Corcumroe was, in 1088 plundered thrice by Roderick O’Connor and Dermot O’Brien. According to the Red Book of Kilkenny, Donald O’Brien, King of Limerick, founded a sumptuous monastery here in 1194 for Cistercian monks, and dedicated it to the Virgin Mary; while other authorities assert that his son Donough Carbrac was the founder in the year 1200. This Abbey was a daughter of that of Suire. It was afterwards made subject to the celebrated Abbey of Furnes in Lancashire.—The cell of Kilsonna, alias Kilshanny, in the county of Clare, was sometime after annexed to this house. The venerated holy bell of Kilshanny, having some time since been taken by the Roman Catholic Clergy from the person who possessed it, in order to put a stop to the sacrilegious use the retofore made of it by swearing upon it is at present in the small collection of antiquities belonging to Mr. Cook, of Parsonstown. In 1267 Connor O'Brien (the tomb in the chancel of this abbey O'Donovan writes was that of Conor na Siúdaine O'Brien who was killed by O'Loughlin of Burren in 1267 at Bel-a-chlogaidh at the head of Pouldoody. See n.a. to 4 Mast. Ad an: 1514), King of Thomond, endeavouring to check the disobedience of the people of Burren was killed in the battle of Siudaine, in this Barony, and was solemnly interred at Corcumroe, where the grand monument, before mentioned, was erected to his memory. Lodge says it was Connor O'Brien, to whom he gives the cognomen ‘Na Suidini,’ from the place of his death, that was killed in 1269 along with his son John—but Archdall (Monast Hib.) says it was Donough O'Brien. Playfair in his large work on Family Antiquity, calls him Connor. The valley between Corcumroe Abbey and the old church at Oughtmana, is called Glennareigh, (the valley of the King) and local tradition informs us, that some prince, or great person, was formerly slain there; but nothing more is known of him. It appears from the earliest patent-roll, in the Rolls Office, Dublin, that Thomas, the son of Maurince, granted to King Edward the First along with the cantred of Ocassin, and the half cantred of Oblyt thirteen villages in Corcomrath to hold for ever—to which Robert, Lord Bishop of Bath, and Wells, then Chancellor of England, and Lords William de Valence, John De Vesey, Othone de Grandison, Gerald Fitzmaurice, John de Barry, John de Cogan and others were witnesses. John, Abbot of Corcomroe, was, in 1418, made Bishop of Kilmacduach; and Archdall states that the Abbey, with eleven quarters of land in Corcomroe and Gleanmanagh, were ultimately granted to Richard Harding.—By an inquisition preserved in the Chief Remembrancer's office, and taken the 6th of December, in the 25th year of the reign of Queen Elizabeth, it was found that Donough M’Murghe O’Brien, of Dromolan, in the county of Clare, died seized of this Abbey, and all its possessions, of the annual value, besides reprisals, of forty shillings, Irish money. Lodge says he had these lands assigned by his father, Morough O'Brien, first Baron of Inchiquin. The patent Roll of the 19th year of King Charles II., preserved in the Rolls Office, Dublin, informs us that on the 7th of March in that year, Murrogh Earl of Inchiquin, obtained a grant of the chiefries, courts, leet, and baron, and the several other ancient privileges enjoyed in the manor of Corcomroe Abbey, in the Barony of Burrin.— The same grant also conveyed to him the parsonage and end vicarage of the parish of Abbey, in which Corcomroe is situated. Notwithstanding the grant to Richard Harding, it appears that the religious establishment at Corcomroe was not forsaken by the Cistercian monks, as late, at least, as 1628, and that it was subject to the Cistercian Lord Abbot of Holy Cross, whose predecessors were mitred abbots and peers of parliament. We accordingly find that subsequent to that year, Father John O'Dea was appointed abbot here. O'Dea was a Cistercian monk, and formerly of the Irish College at Salamanca. Approved in life, morals, and learning, he embraced the monastic rule under Father Luke Archer, Lord Abbot of Holy Cross, in compliance with a vow he made on the 4th of January, 1618. When forty years of age he was appointed vicar to the parishes belonging to Holy Cross Abbey, and is said to have written some tracts of no great importance. He could not have been Abbot of Corcomroe previous to 1623, for there is still extant a MS note of his having been parochus in Holy Cross that year. Probably, however, he was abbot in 1628, as we are informed he ceased to be parochus in the last-named abbey that year, and was succeeded in that office by Malachy Forstal, who continued to officiate for some time. This account of O'Dea is collected from a vellum manuscript, written in 1640, by Father Malachy John Harty, and mentioned in Harris's edition of Ware's Irish Writers. The manuscript belongs to the Roman Catholic Archiepiscopal library at Thurles, and was some time in my possession. Corcomroe is at present a rectory in the diocese of Kilfenora. Near the Abbey is a spring-well, called Tubber-Coeman, at which blind persons sometimes sleep, in the superstitious hope of recovering their eye-sight. Note: The road leading from Corcomroe, up the hill, towards Curromrue was called formerly caccair na cléireach, i.e, The narrow road of the Clergy. O’Donnell’s forces passed by that road with the plunder of Clare in the year 1600. See the four Masters by Dr. John O’Donovan Vol.6. pp. 2196,7 & 2198,9.